How would you feel if you want to say something but can’t? Would you be able to find a job or simply chat with your friends and family? It’s a struggle! That is why iSpeak4U has created HandySpeech which helps hundreds of people and changes their lives by giving them their voice back. HandySpeech 5.0 & HandySpeech Lite 5.0 are here! "I recently lost the ability to speak due to tonsil cancer. I contacted you a little while ago because I wanted to know if your product would work on an Android operating system. You were so helpful and sent me the software for free. Please know that your software is amazingly helpful! I prefer it over any other method of communication, and it gives me something of a voice, allowing me a sense of normalcy as I adjust to my new life." "We are so blessed to have this technology and that Eric developed the wonderful app! My husband really likes the app and hopefully get many years of use out of it. Thank you for developing it! I can now have a conversation with my best friend!" We make conversation a reality for people with speech and hearing difficulties. The only handwriting-to-speech application for mobile devices, HandySpeech provides people with speech disabilities a quick and easy conversational tool. 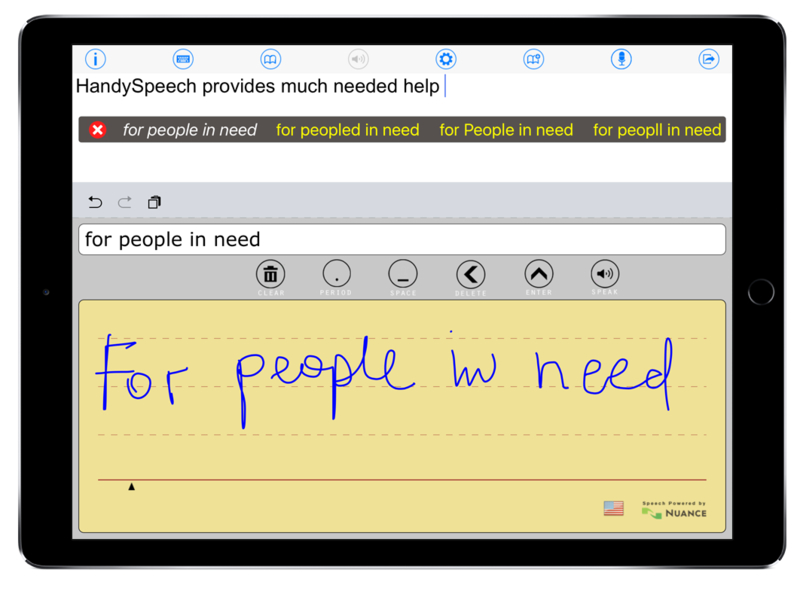 The application’s ability to translate handwritten text into spoken language makes HandySpeech easier to use and more natural than commercially available keyboarding solutions. HandySpeech is a valuable tool for individuals with a variety of speech and language impairments, including those are living with oral, head, neck or larynx cancer, Muscular Dystrophy, Lou Gehrig’s disease, or autism; who have experienced stroke or brain injury; and those with post-operative voice difficulties. HandySpeech was created a couple of years ago by 12-year-old software developer Eric Zeiberg, who was inspired to create the application by his sister -- an autistic individual with speech disabilities. The American School for the Deaf serves the deaf and hard of hearing community as a multifaceted innovative institution dedicated to the development of intellect and the enhancement of quality of life, producing educated and self-directed citizens. We're all familiar with the phrase "The pen is mightier than the sword." Well, now, thanks to voice technologies, the pen is also mightier than disabilities. We have been putting HandySpeech through its paces this morning. We are both absolutely amazed!!! "This is what was needed for our group members and many others who have problems with speaking. It will make a big difference for us as we have been so frustrated. We can't believe - it's a God send" "I want to thank Eric and the family for coming out to speak to the group - it was most uplifting just to know that there is help out there for us. I want to thank you for all the kind words ..."
For stroke survivors that have retained the ability to write, but cannot orally form speech proficiently, there is a new mobile app that can help. NBC: Twelve Year Old Creates App For Disabled Eric Zeiberg wrote a writing to speech iPad app for people with disabilities and the inability to speak. FOXCT MORNING NEWS: Twelve-Year-Old Develops App For Speech Disabled Sister Twelve-year-old Eric Zeiberg, from West Hartford, developed an app, which assists users with speech disabilities. He was inspired by his sister, who is autistic, and talks about the app. My sister Julie is an autistic young girl who has great difficulties with communication and speech. She is a real sweetheart and teaches us every day to care for people in need, to be compassionate, understanding, helpful, and creative. This web site and our applications are inspired by Julie's life. is a valuable communication tool for individuals who have lost their ability to speak due to injury or disease, and for those who is recovering from a surgery.